Kluyveromyces is a genus of ascomycetous yeasts in the family Saccharomycetaceae. 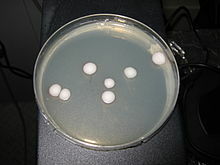 Some of the species, such as K. marxianus, are the teleomorphs of Candida species. This yeast-related article is a stub. You can help Wikipedia by expanding it. This page was last edited on 21 March 2018, at 04:04 (UTC).